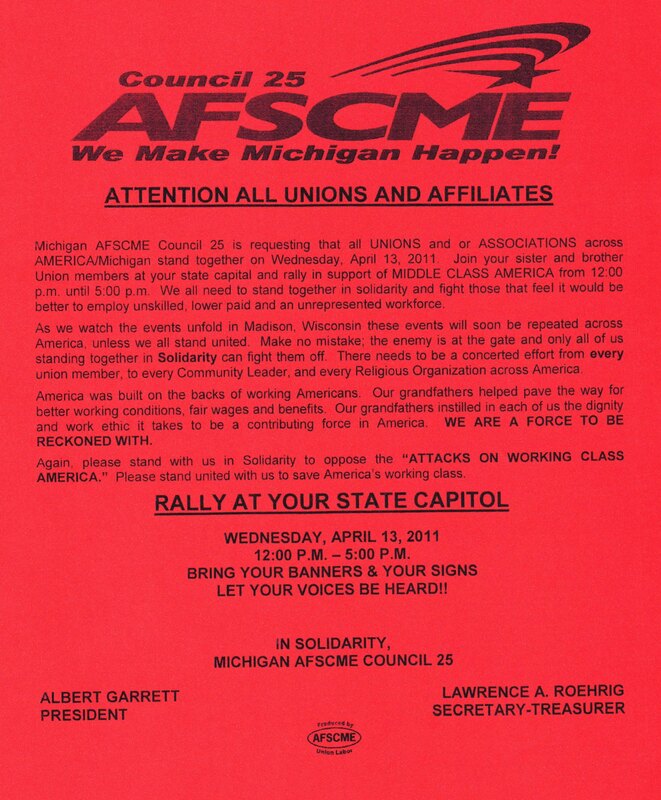 MICHIGAN AFSCME COUNCIL 25 IS ASKING ALL UNION MEMBERS TO ATTEND RALLIES IN THEIR STATE CAPITOLS FROM 12 NOON TO 5 P.M. (DURING WORKING HOURS) ON WED. APRIL 13. CALL 313-964-1711. AFSCME IS HOLDING OPEN MEETINGS EVERY WEDNESDAY AT 5:30 P.M. AT THE COUNCIL 25 HALL AT 600 W. LAFAYETTE AND THIRD; MANY DIFFERENT UNIONS ARE ATTENDING ACCORDING TO DETROIT’S CHIEF AFSCME NEGOTIATOR CATHERINE PHILLIPS. I’m proud to represent 155,000 public school employees who have dedicated their lives to preparing students for a brighter future. But I’m worried about what the future holds for Michigan students, communities, public school employees, the middle class and the state in general. Schools face devastating budget cuts that translate into larger class sizes, fewer staff members and reduced programs. Schools will close, and some districts will face financial ruin. For a district that’s already struggling to provide a quality education, what kind of future can be provided to students with a minimum of $470 less per child? As educators, can we stomach the thought that students will be forced to learn in classrooms with 40, 50 or 60 students next year? Or that they’ll continue to do without the most basic supplies — paper, pencils, textbooks and computers? So distraught are educators over the learning conditions of their students, many are considering how to convince lawmakers to provide help, not more hurt. The educational future of more than a million Michigan students must not be sacrificed. We will not stand silent while Michigan’s public schools and the middle class suffer more. And suffer they will, especially in light of a new law giving emergency managers of schools the power to take over financial and academic decisions. What kind of future are we offering students when accountants — not trained teachers and administrators — decide curriculum? A rigorous curriculum, small class sizes, safe and clean buildings, and other important resources to ensure student success don’t just happen. Until now, school employees have used the collective bargaining process to establish learning conditions for students as well as their own working conditions. With collective bargaining rights in jeopardy, what kind of future do students have when their learning environments are substandard? If some legislators have their way, schools will have to bid or outsource support services. How do you bid the job of the food service employee who helps a child without lunch money, or a custodian who befriends a troubled student? When those trained and loyal school employees lose their jobs, what kind of economic future does the community have? Gov. Rick Snyder says lots of things. He says he believes in collective bargaining and shared sacrifice. He says he believes in a better future for Michigan that doesn’t follow the path of Wisconsin. Well, his actions are speaking louder than his words. 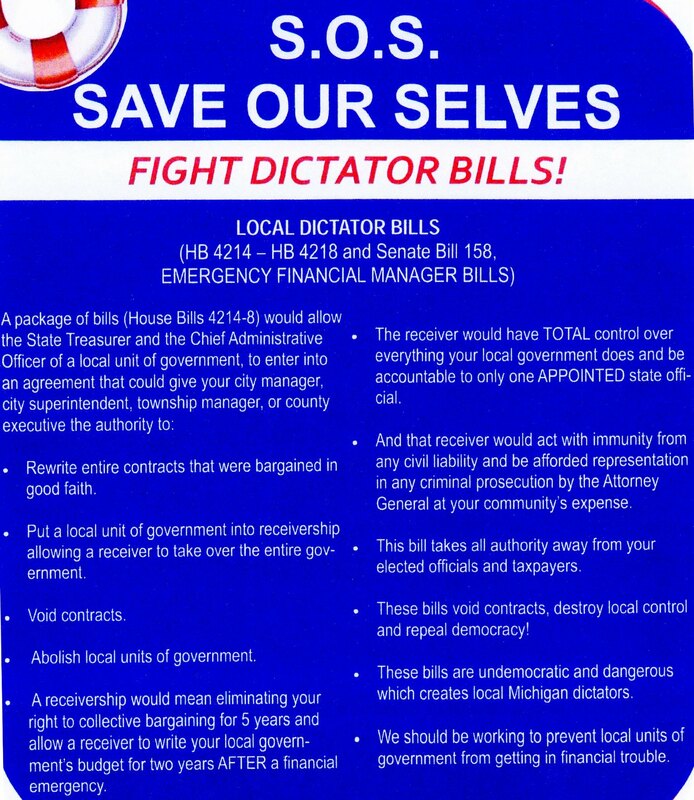 He signed the emergency manager bill that when applied could eliminate collective bargaining for thousands of workers. So far, his definition of shared sacrifice is to increase taxes on seniors and force the poor to pay for a massive business tax cut. And continued attacks on Michigan’s middle class put us squarely on the path to our own Wisconsin. Snyder talks about the “we” versus “me” mentality that will move us toward a brighter future. I’m not sure who the “we” is that he’s talking about. We the people have had enough of the attacks on schools, on school employees, on public workers, on voters, on taxpayers, on communities and on the people who built this state and the people who will sustain it. If there is going to be a better future for Michigan, it will be these people — not the politicians — who create it. 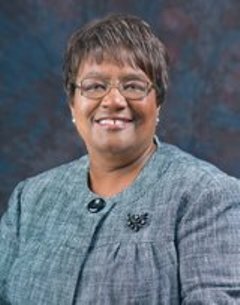 Iris Salters is president of the Michigan Education Association, a union that represents teachers and education support staff. A Dane County (Madison) judge issued a temporary restraining order today to block publication of Governor Scott Walker’s anti-collective bargaining law. The county district attorney had sued, claiming that Republican legislators violated the 24-hour notice requirement in Wisconsin’s “open meetings” law when they rushed through a senate vote the evening of March 9. The law had been scheduled for publication March 25, but the judge said the lawsuit should be heard first. The legislature could, of course, re-vote on the measure, this time taking the time to do so legally. What does the bill pushed through by Wisconsin Republicans do? The bill ends collective bargaining for university employees, one group of hospital workers, and childcare and homecare workers, who won collective bargaining rights in the last legislative session. All other public employees–state employees, K-12 teachers, village, town, city, county and technical colleges–retain collective bargaining for wages only. Police and firefighters are excepted. If a union wants a raise above the increase in the consumer price index, though, it must go to a voter referendum. The bill also ends dues check-off and “fair share” payments in lieu of dues from non-members. Each public sector union must hold an annual vote of members if it wants to re-certify the union–and it must win by a majority of the unit, not a majority of those voting. The bill imposes benefit concessions on state workers amounting to an average 8 percent pay cut. Because Governor Scott Walker is proposing a nearly $1 billion cut in state aid to schools, he says school districts should make up the difference from their employees. When was the law scheduled to go into effect? 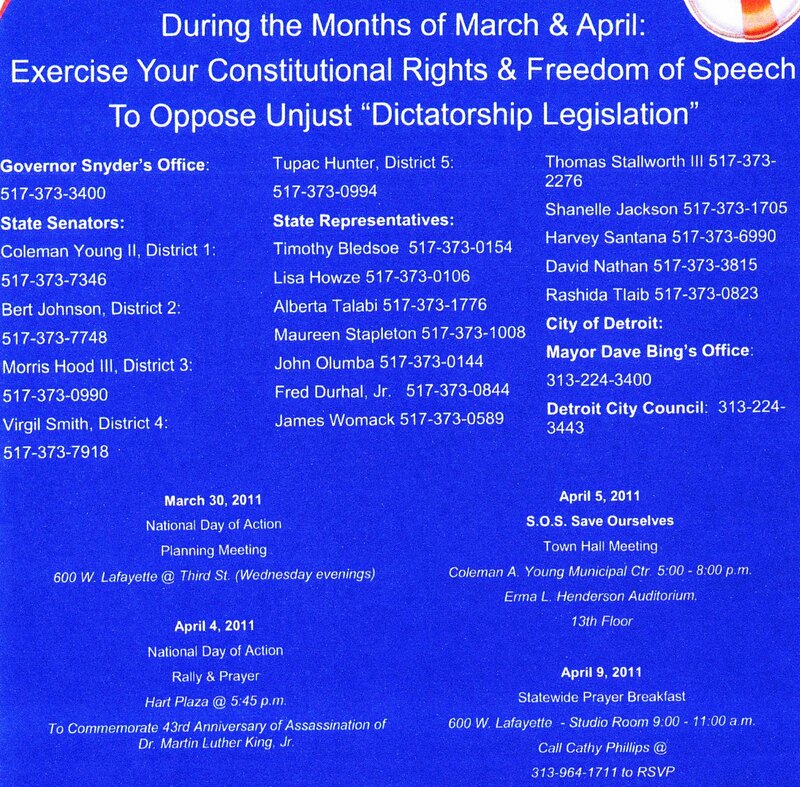 To Walker’s annoyance, Democratic Secretary of State Doug La Follette set the publication date for March 25, to give unions and employers time to negotiate new contracts before then. What does it mean for public workers’ current contracts? Any contract in force when the new bill takes effect will continue until its expiration date, trumping the new law. 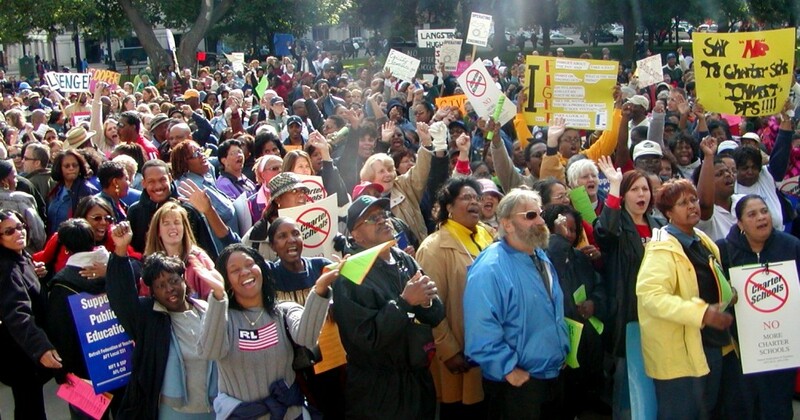 Thus public unions have been scrambling to extend current contracts or bargain new ones. Management, of course, has all the cards, and members are ratifying big concessions. The Madison teachers union, for example, ratified a contract March 13 that freezes pay till mid-2013 and increases teachers’ payments for their pensions and health insurance. Time will be added to the school day to make up for the teachers’ sick-out in February, and “letters of counseling” will be added to their files. Planning time for elementary teachers is cut back. The contract retains dues check-off. In La Crosse, 400 out of 650 teachers showed up for a heart-wrenching ratification meeting. After long discussion, they voted unanimously for a contract that was concessionary. Still, it’s a contract. State employees won’t have that opportunity, as their previous contract expired March 13 and Walker will not bargain a new one.